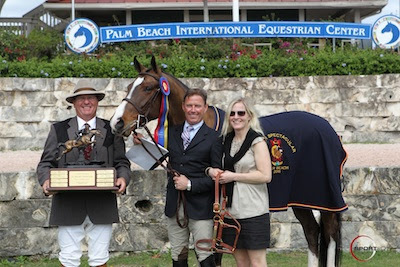 Wellington, FL - February 17, 2011 - The 2011 FTI Winter Equestrian Festival continued on Thursday with World Champion Hunter Rider (WCHR) hunter competition at the Palm Beach International Equestrian Center. All of the rated professional hunter divisions concluded today and awarded championship honors for week six. Champion and reserve champion horses will qualify to compete in the WCHR Palm Beach Hunter Classic Spectacular on Friday evening, showcasing the hunters on an international stage. No surprise as a qualifier for Friday night's classic, four-time WCHR Professional Champion Scott Stewart earned multiple championship awards today with his string of talented horses. 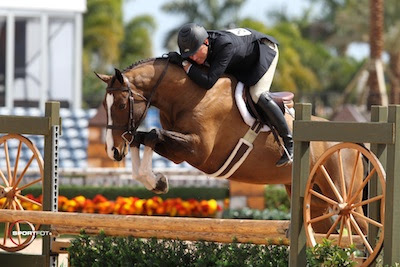 Stewart dominated the First Year Green Hunter division, earning the championship aboard Inclusive and the reserve championship aboard Reality, owned by Krista Weisman. Inclusive, an eight-year-old Warmblood gelding, finished first in both classes over fences today and earned first and second place ribbons on Wednesday. Reality, an eight-year-old Mecklenberg stallion by D'Olympic, earned second in both classes today and placed third on Wednesday. "He is just really a fantastic jumper," Stewart noted. "I bought him last summer in July and after Capital Challenge, we started again here in the beginning of December. He has been great." Reserve champion Reality also competes in the Amateur-Owner Hunter 3'3" division with his owner, Krista Weisman. "I bought Reality a year and a half ago and he is a really nice horse," Stewart said. "He is a stallion and I have bred a lot of my broodmares to him. He is really beautiful and so easy going." Discussing each horse's ride, Stewart commented, "Reality is a little bit more laid back. Inclusive tries too hard sometimes; he jumps really high. Reality is just really pleasant and he is such a pretty horse when he goes around. They are both very brave, so they should handle the night class under the lights really well." Stewart also earned a tricolor in the Green Conformation Hunters today riding Empire, owned by Becky Gochman. The pair earned first place ribbons in all four classes over fences and a third under saddle. Kelly Farmer took home the reserve championship honors aboard Crown N Sceptor, owned by Larry Glefke. Other top competitors today included Louise Serio, who rode Castle Rock, owned by Bryan Baldwin, to the High Performance Hunter championship. Kelly Farmer and Rosalynn, owned by Larry Glefke, took reserve. Cookie Beck topped the Second Year Green Hunters riding Lisa Cudahy's Last Call to championship honors over Whatever, owned by Boggs Hill and ridden by Tim Goguen. Continuing through the day, Ken Berkley guided Sambalino, owned by Becky Gochman, to a championship tricolor in the Regular Conformation Hunters with Peter Pletcher and Garfield, owned by Steeplechase Farm, coming in reserve. The Performance Working Hunter 3'6"-3'9" division completed the day's classes with a championship win for Small Affair, ridden by John French for owners Iwasaki & Reilly. Onassis, ridden by Elizabeth Boyd for Sarah Ward, finished in reserve. 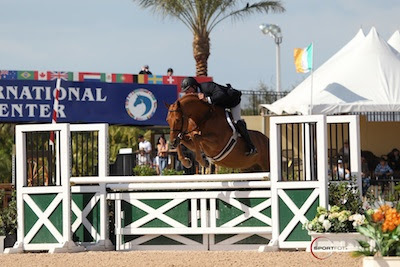 The sixth week of the FTI Winter Equestrian Festival will continue tomorrow with Junior and Amateur-Owner Hunters competing in the International Arena as they try to qualify for their WCHR Hunter Classic Spectacular on Sunday.